DIMMABLE - Seamless dimming capabilities (10%-100%) that fit any mood or decor. Our baffle trim recessed lighting fixtures are instant on with the latest in LED flicker free technology for maximum eye comfort. SIMPLE INSTALL - Follow our installation guide for a quick and easy setup, suitable for damp locations. 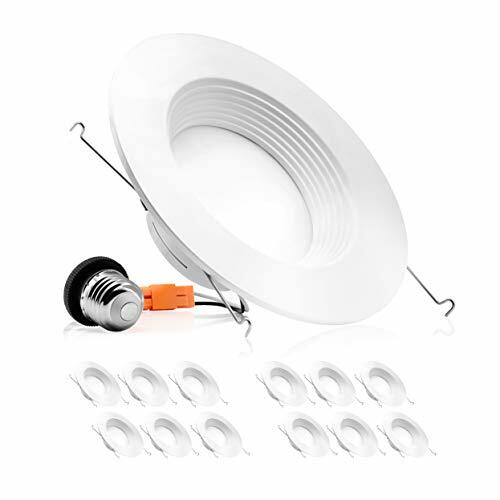 Directly install retrofit fixture to the ceiling for instant bright light in your kitchen, family room, bedroom, bathroom and common areas in your home or office. UL CERTIFIED & ENERGY STAR LISTED - We uphold the highest standards for all our products by testing each product for optimal performance and safety. Our LED retrofit downlights are eco-friendly, they don't contain mercury and don't emit UV or IR. Product Specifications Easy to install and operate. Can be installed into a 2.75", 3.5", or 4" Junction Box OR any 5" or 6" Recessed Can Energy saving, Long lifespan. Light is soft and uniform, Safe to eyes Instant On, NO flickering, NO humming. Dimmable with most LED Dimmers, Including Caseta Wireless Dimmers Green and eco-friendly without mercury. Certifications: Energy Star, ETL, Title 24, RoHS Compliant, FCC Color Temperature: 2700K, 3000K, 4000K, 5000K CRI: >90 Lumen: 1050LM Beam Spread: 120 . Optical design efficiently directs light output in an 120 beam angle with low glare. 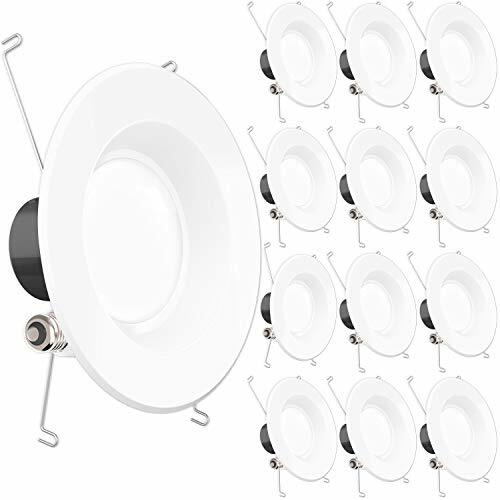 Input Voltage: 120V AC Waterproof Rating: Damp Location rated Housing Color: White Suitable for Damp Locations Warranty Time: 5 Years Fixture Weight and Size Fixture Weight: 0.55 lbs. Diameter: 7.25" Thickness: 0.6" Packaging Weight and Size 1 Pack: 0.7 lbs. , 7.8" x 7.8" x 2" (LxWxH) 4 Pack: 2.95 lbs., 15.8" x 5" x 8.25" (LxWxH) 12 Pack: 10.5 lbs. , 16.6" x 14.6" x 9" (LxWxH) Notice For User Turn off electrical power before starting installation of light fixture. The input voltage and lamps should be matched, after connecting the power line. 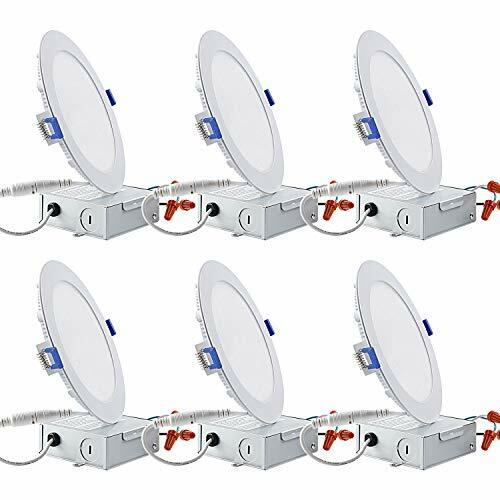 This product must be installed in accordance with the applicable installation code by a person familiar with the construction and operation of the product and the hazards involved. Caution- risk of fire. Consult a qualified electrician to ensure correct branch circuit conductor..
SAVE 88% IMMEDIATELY. Save 88% on your energy bill by replacing 120W with 15W LED. 50,000+ hours of life. 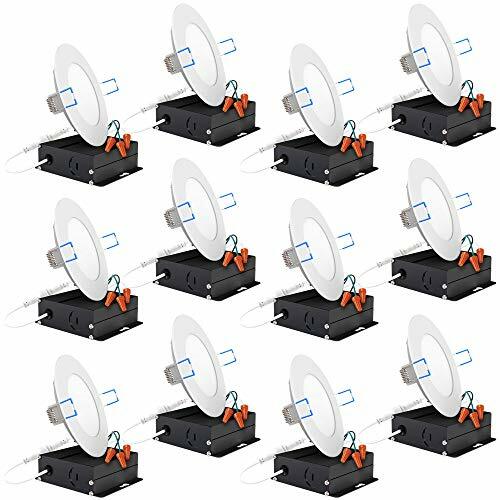 EASY INSTALLATION: Can be installed into any 5 or 6 Recessed Can OR any 2.75, 3.5, or 4 Junction Box. Optimal for new construction and retrofit applications. Installation options available for both. Installation manual can be found in photo options. CERTIFICATIONS: ENERGY STAR certified which means our products meet strict requirements to be considered energy efficient and reliable. ETL-listed to avoid electrical shock and fire hazard making our LED Downlights extremely safe. Additional certifications: FCC compliant, Title 24, Damp Location rated. DIMMABLE. Customizable brightness comes courtesy of its dimmable capability so you can set the preferred mood lighting. Compatible with most LED dimmers. MODERN SLEEK THIN DESIGN. 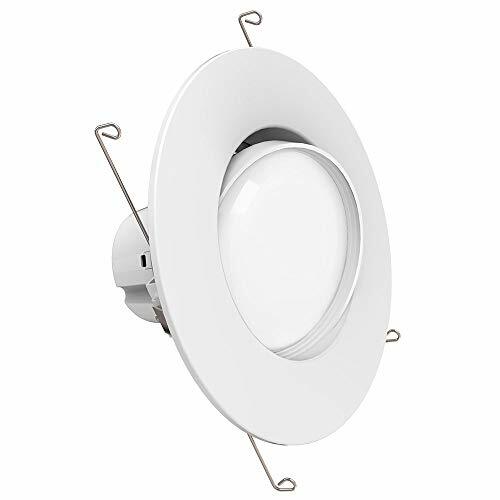 0.2 thickness allows for an ideal flush mount look, similar to that of a standard modern downlight. 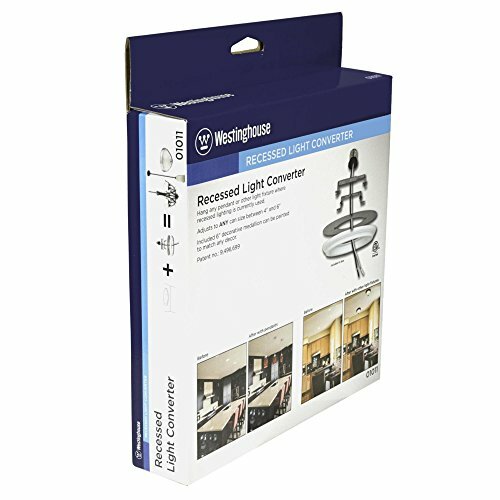 This unique patent-pending Westinghouse Recessed Light Converter offers an easy way to transform your existing recessed lighting into a pendant or light fixture with no major remodeling. Let your creativity inspire you to update your home lighting with this quick and easy upgrade. 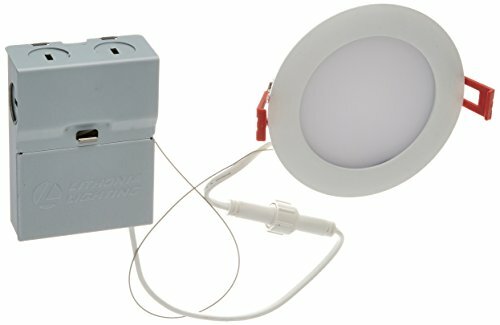 Hang any pendant or other light fixture of 50 pounds or less where recessed lighting is currently used in your home.The Recessed Light Converter adjusts to any can size between 4-inch and 6-inch, there are no visible screws or hardware and the decorative medallion can be painted to match any decor. 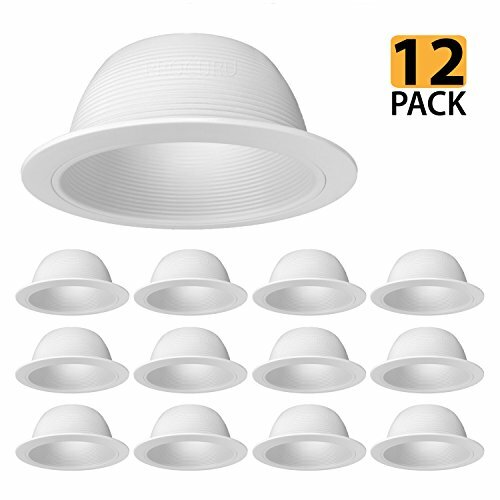 This converter works with existing recessed cans that use medium base PAR16, R16, A19, R20, PAR20, BR25, BR30, R30, PAR30, BR38, PAR38, BR40 or R40 light bulbs and is suitable for damp locations.Perfect for kitchens, family rooms or anywhere recessed lighting is used. 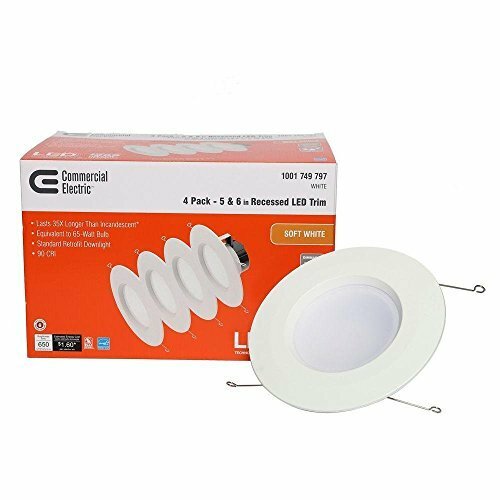 It includes a versatile white decorative medallion, adjustable bar, socket adapter and mounting hardware for convenient installation.This Westinghouse Recessed Light Converter is CETL listed for safety.Product reference number 01011. Turn off electrical power before starting installation of light fixture. The input voltage and lamps should be matched, after connecting the power line. The input voltage and lamps should be matched, after connecting the power line. Please make sure the wiring section is insulated. 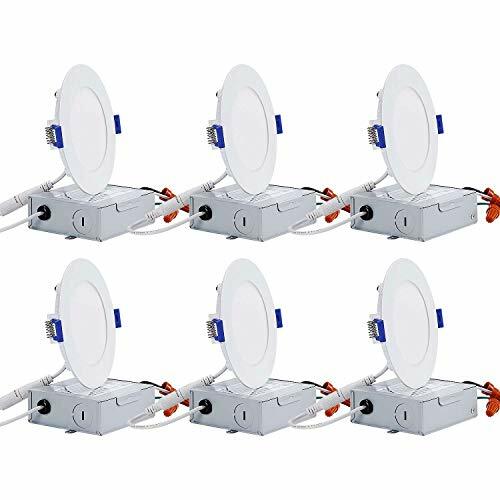 This product must be installed in accordance with the applicable installation code by a person familiar with the construction and operation of the product and the hazards involved. Caution- risk of fire. Consult a qualified electrician to ensure correct branch circuit conductor. SAVE 88% IMMEDIATELY. Save 88% on your energy bill by replacing 100W with 12W LED. 50,000+ hours of life. ENERGY STAR certified. BAFFLE TRIM DESIGN. Inside the surface of the trim is ribbed to trap and shape the light downward. Instant start, NO flickering, NO humming. CERTIFICATIONS: ENERGY STAR certified which means our products meet strict requirements to be considered energy efficient and reliable. ETL-listed to avoid electrical shock and fire hazard making our LED Downlights extremely safe. Additional certifications: JA-8 Title 24, FCC compliant, Wet Location rated. EASY INSTALLATION. Ready to fit in any 5 or 6 recessed housing cans. E26 Adapter and Title 24 connector included. No additional accessories are required. DIMMABLE. 100-0% smooth dimming capability (dependent on the dimmer). 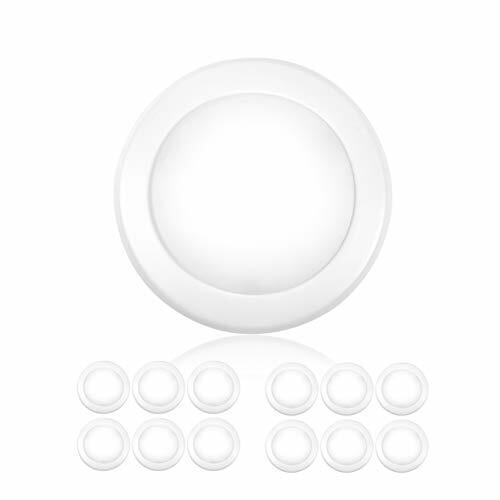 Compatible with most LED dimmers. Compatible with Lutron Caseta Wireless Dimming Systems. DIMMABLE - Seamless dimming capabilities (10%-100%) that fit any mood or decor. Our smooth trim recessed lighting fixtures are instant on with the latest in LED flicker free technology for maximum eye comfort. UL CERTIFIED & ENERGY STAR LISTED - We uphold the highest standards for all our products by testing each product for optimal performance and safety. 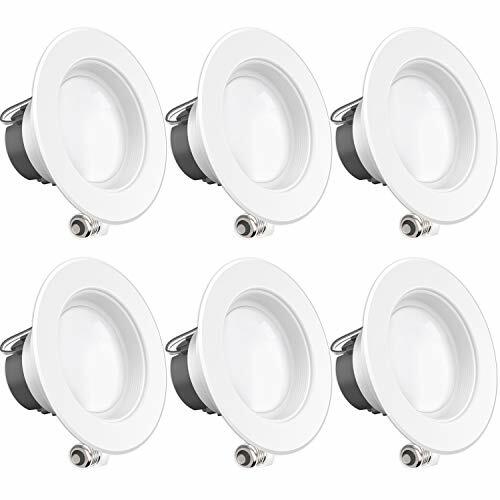 Our LED retrofit downlights provide instant bright light and no buzzing or flickering for maximum eye comfort. you are troubled by the little space of ceiling or high electricity costs. without housing can, supporting retrofit, remodel or new construction installation. $1663.2 electricity cost with the 6-pack set in its 36,000 hours lifespan. the ceiling. Only need 2 inch clearance for installation. Its structure could effectively prevent moisture and heat so that it is suitable for use in humid environments. 5-year warranty to protect your interests. DIMMABLE - Seamless dimming capabilities (10%-100%) that fit any mood or decor. 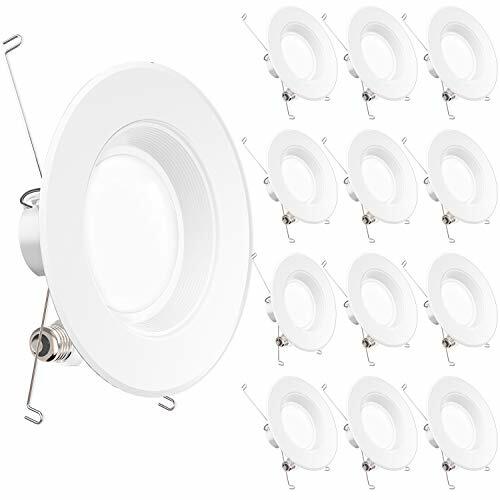 Our gimbal recessed lighting fixtures are instant on with the latest in LED flicker free technology for maximum eye comfort. SIMPLE INSTALL - Follow our installation guide for a quick and easy setup, suitable for damp locations. 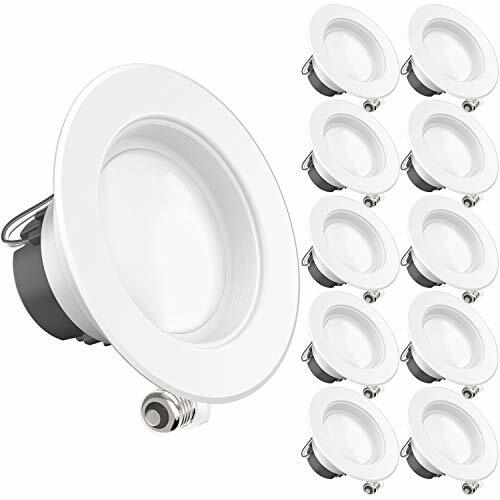 Directly install gimbal fixture to the ceiling for instant bright light in your kitchen, family room, bedroom, bathroom and common areas in your home or office.